I can’t be the only bee keeper that has a Google Alert set up for ‘London Bees’ triggering an email each time the topic appears online? Though usually, the search results are more often about football than honey. As a household of season ticket holders for our beloved Brentford FC, we don’t mind hearing of the transfers, the goals, and the ups and down of our local football club. I am secretly very proud that they are known as ‘The Bees’ and often wonder if there is any forage on Griffin Park that might attract our ‘Real Brentford Bees’ to go feasting there. I’ve looked into the history of their nickname and wonder whether our little corner of West London, that used to be orchards and market gardens supplying Covent Garden in Victorian times, was also famed for it’s honey bees that were priceless for pollination and heavy with honey due to fabulous forage. A local historian suggests that they were named The Bees as their football shirts used to have horizontal stripes and, of course, today’s young fans believe that Bee is just a syllable shorter than Brentford for an easy chant from the terraces. I’m sticking with my belief that Brentford has a longstanding history of keeping honey bees and that my buddy, Thomas, and I are keeping that tradition strong! So for the Real Brentford Bees, here at Hen Corner, we’ve had a season that has been just as unpredictable as that of the red and white striped boys at the end of the road. We’ve had three types of swarms (shook, artificial and natural), an unfortunate diagnosis (of Nosema), successful treatment of aforementioned affliction, supers on, supers filled, supers empty – where did that honey go? As for the teams? We started out with two colonies, went up to three, then four, and after a merger, we were back down to three. Over the season, we’ve lost a few key players, namely four queens, to injury, forced retirement or possible transfer. What about the fans? Well fortunately, this year has been very well supported. We’ve had bee fans of all ages come to meet the teams. 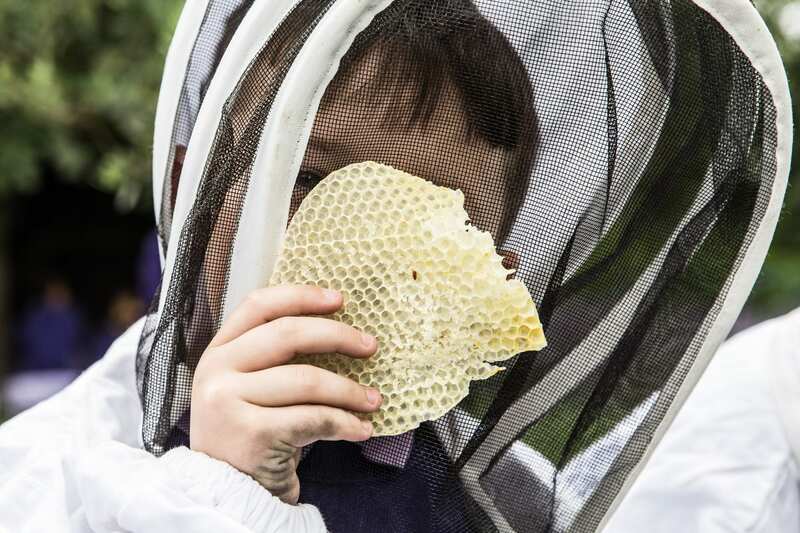 Junior bee fans have included 60 school children, 15 Girl Guides and 31 guests on our family courses. Whereas adults who have been to further their experience have included 41 guests and 3 mentees. Whilst it’s not a formal sponsorship deal, we were delighted to welcome Just Bee Drinks, as seen on BBC’s Dragon’s Den, to join in with a family course giving out bee friendly seeds for pollinators and their delicious honey based drinks. It’s always nice when people value our wonderful players and want to cheer them on! We packed up 175 jars of our Apple & Chilli Jelly to take to a pop up shop at Town End Farm Shop in the beautiful Yorkshire Dales. Local friends and neighbours have dropped off some home grown grapes, so we are going to have a go at wine making! Did you notice many bees in your area over the summer? If so, were they small honeybees or big bumbles?